Archaeopteryx: Icon of Evolution was on display at the Houston Museum of Natural Science from April 23 through September 6, 2010. The exhibition was on display at the Houston Musuem of Natural Science in Sugar Land from November 22, 2010 through March 20, 2011. 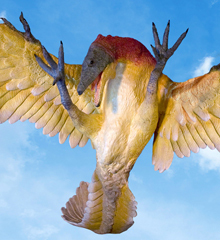 Most scientists believe that birds evolved from small therapod dinosaurs. The key step was the development of feathers, turning animals that could walk or climb into animals that could fly. The first fossil discovered with feathers was found in 1861; just two years after Charles Darwin published his theory of evolution in 1859. This fossil is known asarchaeopteryx and is the earliest bird known to science. Archaeopteryx, which lived over 150 million years ago, is a classic example of an evolutionary link between two groups of animals. As of today, there are only ten known specimens of archaeopteryx. This premier exhibition presented some of the finest known fossils from the late Jurassic period showing life at the time of these first birds. Fossils from the world renowned quarries of Solenhofen, Germany were featured. This exhibition was organized by the Houston Museum of Natural Science. As Associate Curator of Paleontology, Temple developed the Museum’s current Paleontology Field Program. His team excavates a Permian locality in North Texas, looking for fossils of Dimetrodon, the most fearsome pre-dinosaur predator, as well as every other sign of life, in order to more accurately reconstruct a 250-million year old….